Desert Mountain Real Estate is blessed with an elevated location in peaceful North Scottsdale. From this prestigious location, you can capture magical city light views, breathtaking sunsets, mountains in every direction, and of course plush, green fairways. This 8,000-acre, master planned community in North Scottsdale was created for a membership accustomed to the highest level of quality, personal service and thoughtfully planned amenities. 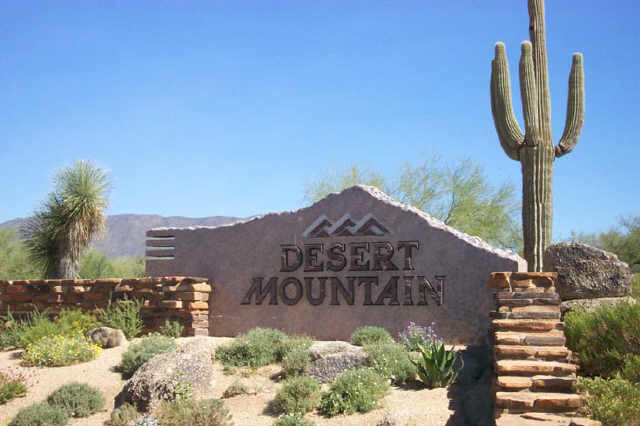 Surrounded by stunning mountain vistas and blessed with the lush, dramatic landscape of the high Sonoran Desert, Desert Mountain Real Estate is truly without compare in the Southwest. The community's Cochise golf course annually hosts The Countrywide Tradition, one of the Senior PGA Tour's major tournaments. At Desert Mountain Real Estate, the intimacy and exclusiveness of has yet to be matched. Golf at Desert Mountain, featuring the finest golf courses in Scottsdale, needs very little introduction. Simply put, there are six private Championship Jack Nicklaus Signature Golf Courses from which to choose - the most in one location anywhere. Since opening in 1986, no other club has come to define championship desert golf more than Desert Mountain Real Estate. In addition to local recognition as possessing some of the finest golf courses in Scottsdale, Desert Mountain golf clubs are also recognized on a national level. When the Champions Tour Event "The Tradition" was held here, the Senior PGA Tour ranked the Cochise course as the "Best Maintained Golf Course" on the tour. The Renegade and Cochise courses consistently rank in the national golf magazines' top 100 lists. Opened in 2003, The Outlaw course is the newest example of Desert Mountain golf at its finest. This World Class Community isn't just about golf. Desert Mountain Real Estate offers several other world class amenities to members such as a spa and fitness center and some of the best tennis in the Southwest. Desert Mountain Real Estate / Homes and the Golf Community are well worth taking a look at, if you're looking for a luxury golf community in North Scottsdale. The beauty and luxury of this Scottsdale Golf Community make the drive to Desert Mountain worth it. At Desert Mountain there's a Luxury Home for sale or being built for the most discerning buyer, or one can be built. Desert Mountain has numerous spec homes for sale or under construction. Let Bill Slack help you find the perfect Desert Mountain Home for sale. Let an experienced Desert Mountain Realtor help you find the perfect new home. At Desert Mountain you will find the most extensive golf practice facilities in Arizona--with multiple pitching, chipping, putting and bunker areas, and four separate practice ranges including target greens. Desert Mountain's PGA-trained professionals provide training to help members at any skill level. Desert Mountain offers a world-class tennis facility. Referred to: as the "Wimbledon of the West" because of the magnificent stadium grass court. Additionally, there are five clay courts and three fast-playing hard courts. To compliment the playing surfaces, the tennis facility features gorgeous surroundings and views. Six distinctive Clubhouses offer a variety of dining experiences - from casual, family or formal. The Desert Mountain restaurants provide special places where members can bring their friends and family Whether you desire Southwestern, classic Steakhouse specialties, Tuscan-inspired Italian, authentic Mexican or American fare, you can experience it at Desert Mountain. Discover the Award-winning Lifestyle at Desert Mountain, Real Estate in Scottsdale, Arizona. When you decide to buy Scottsdale AZ Real Estate, (whether it's Desert Mountain Real Estate or some other premium Scottsdale AZ Real estate) be prepared to live amidst some of the most renowned luxury resorts and spas, championship golf courses, gorgeous homes, and natural desert beauty in the world. With all these amenities at your fingertips you’ll be living in paradise.